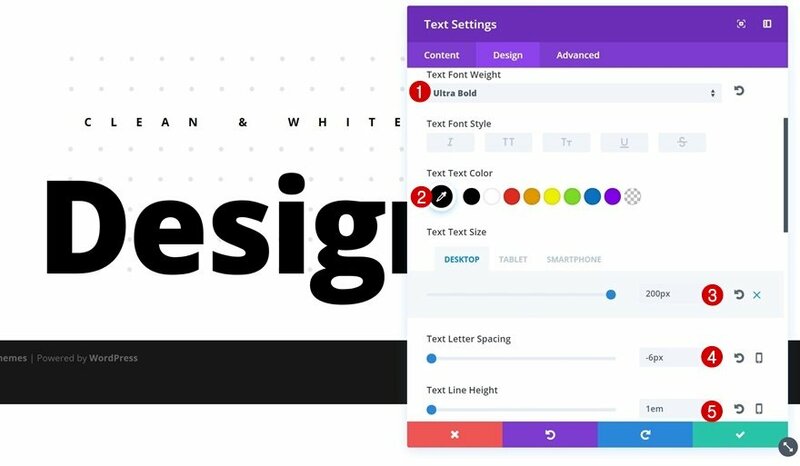 For each one of the design styles, we’re going to go over a few Divi techniques that will make reaching that type of design a lot easier. 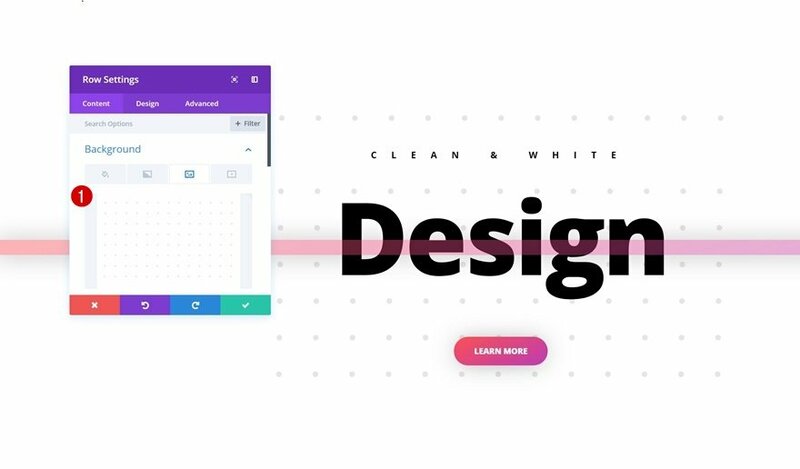 We’ll start off with the clean and abstract design style. 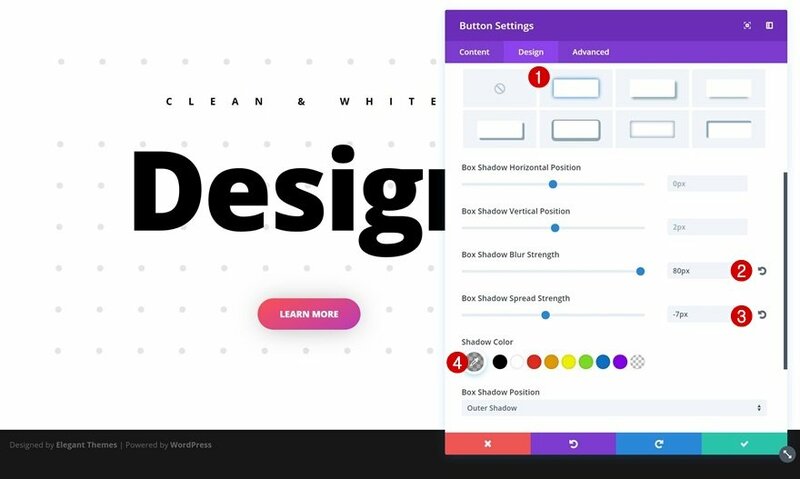 We’ll share 8 techniques you can apply to your design elements using Divi’s visual builder and afterwards, we’ll create two stunning examples from scratch! In most cases, the term ‘clean’ means a lot of ‘white’ as well. 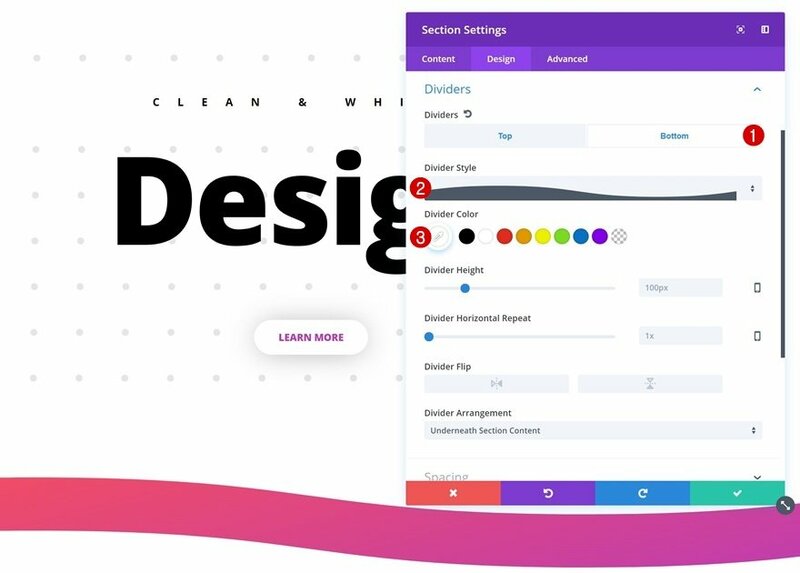 That doesn’t mean you should avoid colors in general, but avoiding colors in the main structural elements of your website (such as sections) can contribute a lot to giving visitors a clean impression. 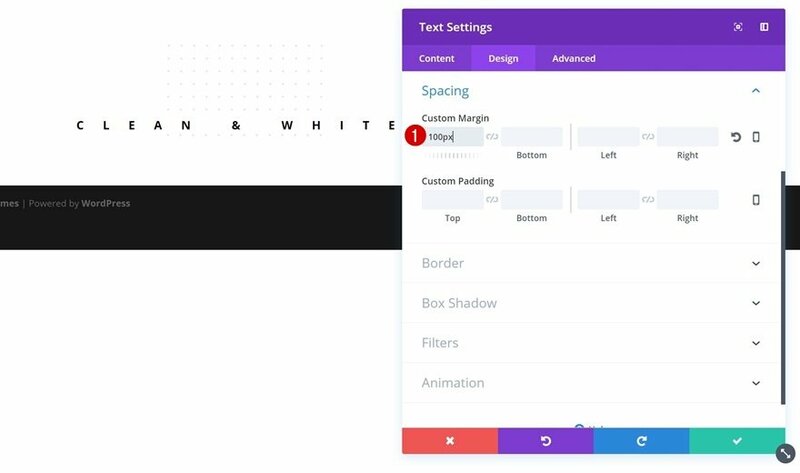 To reduce the white and clean feel of your section, you don’t necessarily have to focus on your section’s settings. 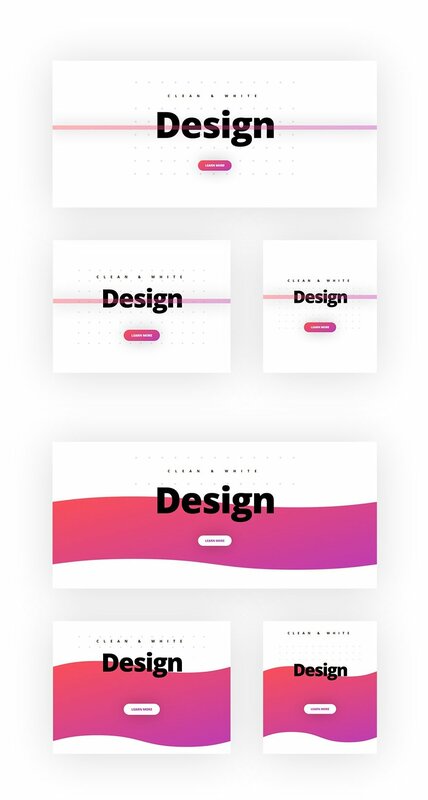 You can easily create a subtle and abstract design using row pattern background images, for instance. It will only cover the background of your row and will leave enough white space to maintain that overall clean and white feeling. 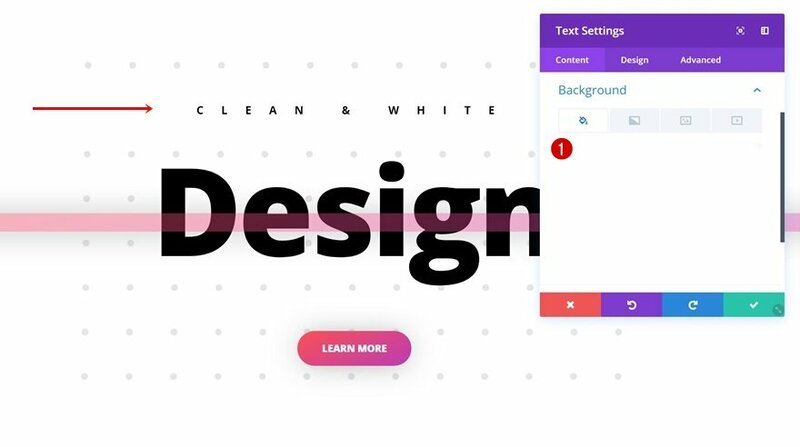 The pattern background you use should contain a white background color and only a part of that white background should be covered with patterns. Make sure you don’t add any patterns to borders or corners. 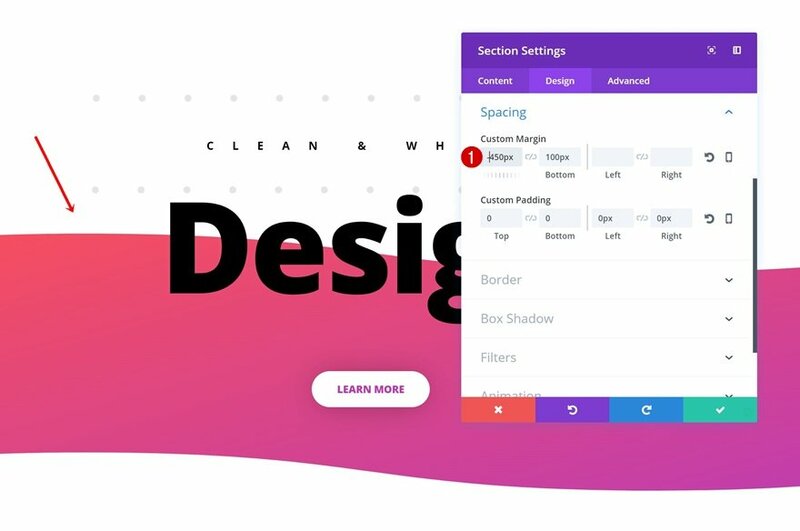 This allows your row and section backgrounds to blend. 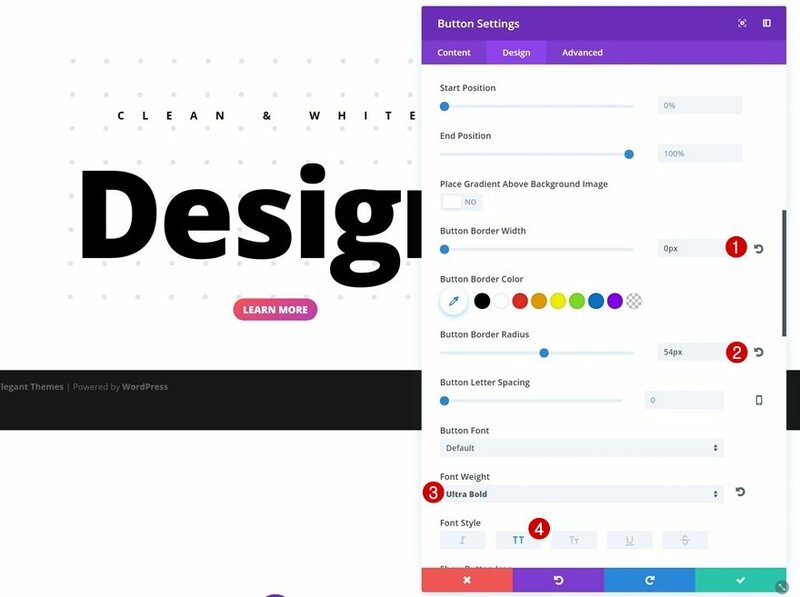 Further down this post, in the part where we’ll recreate the examples, you’ll be able to save the pattern image and use it for your own web design projects! 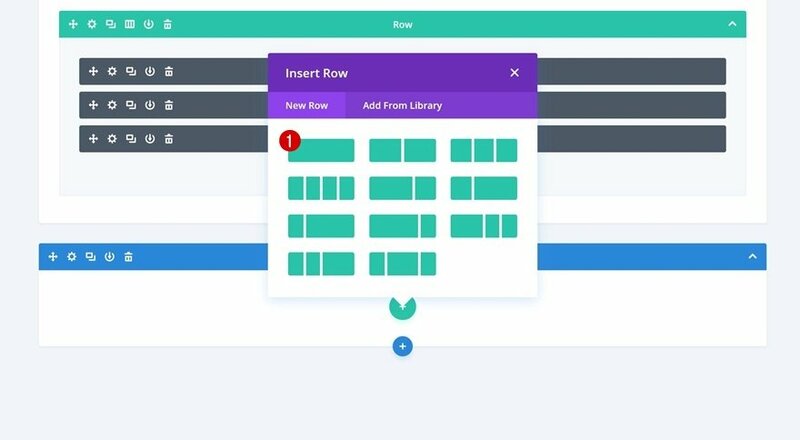 The design hierarchy Divi contains (section → row → column → module) lets you do the same thing to your row pattern background. 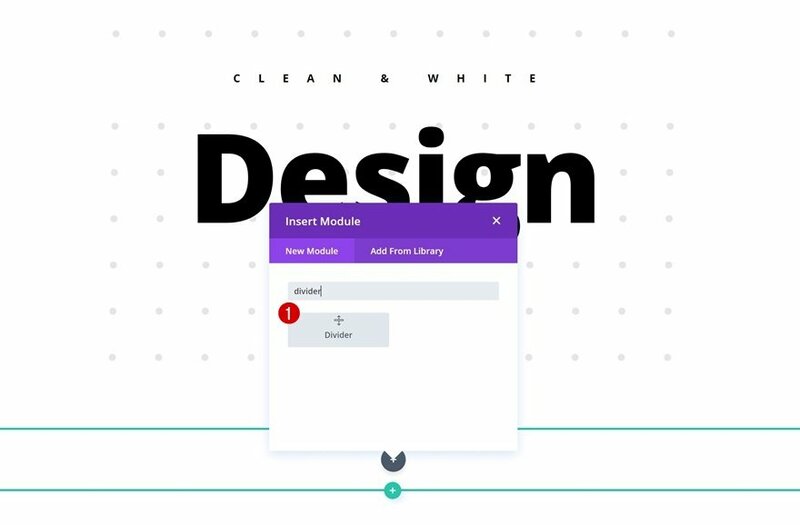 By using a white background color for the modules of your choice, you can override the row pattern background that your module takes up. 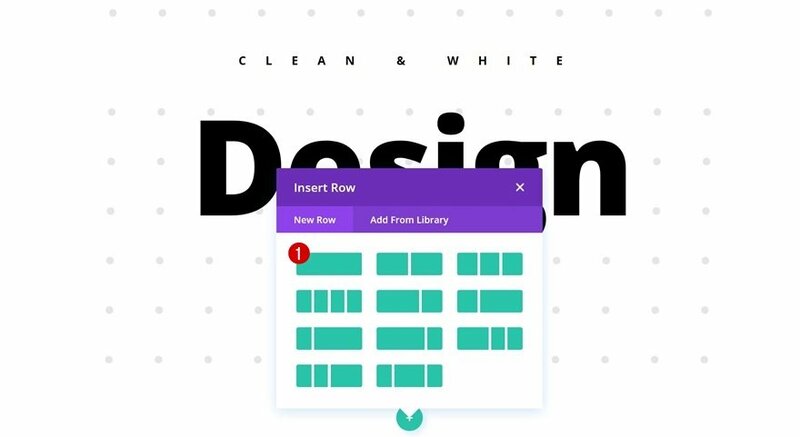 This, in combination with a white section background color, allows you to make modules and section backgrounds merge while still keeping the row pattern background intact for other modules you’re using. 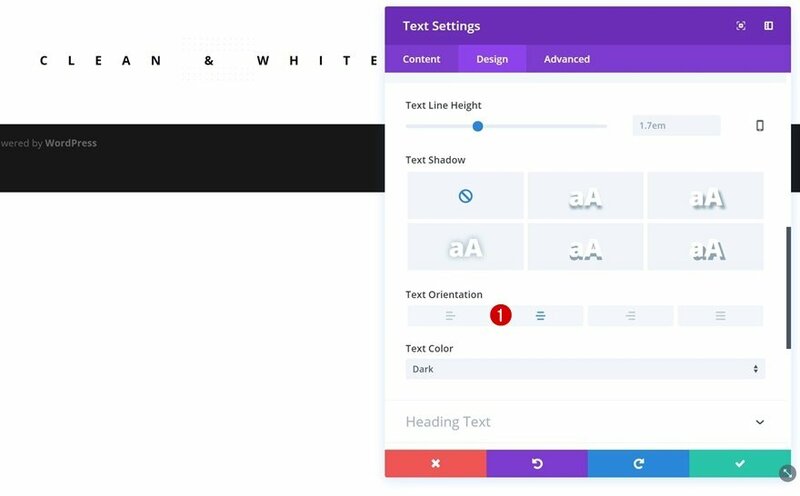 Using a white section background color means you’ll need to seek striking elements elsewhere. 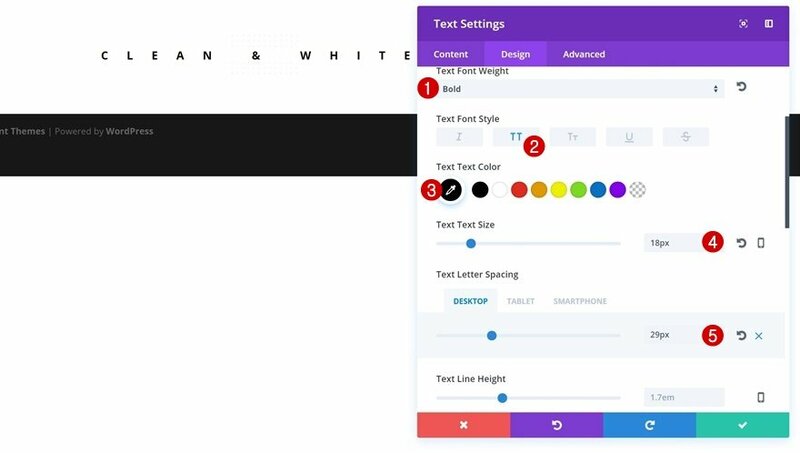 One of the things you can do to draw attention is creating contrast in font sizes. The bigger the difference in size between your subtitle and main title, for instance, the more your main title will pop. Just like playing around with font sizes, using extra letter spacing on different can bring stunning results. 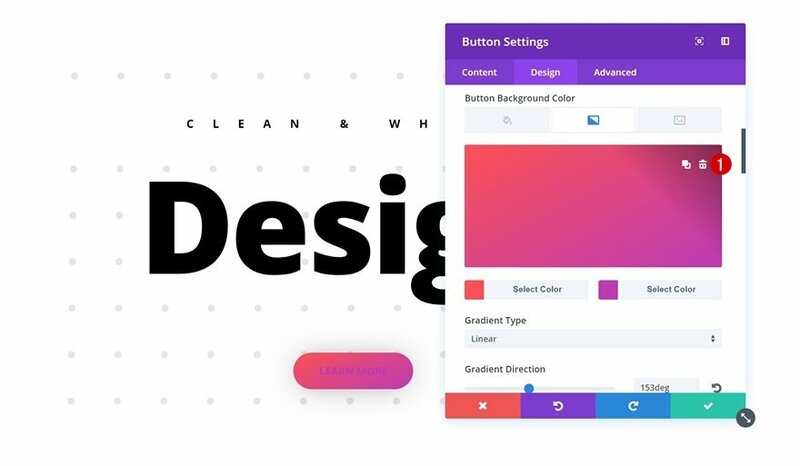 It helps to enhance the contrast between content you’re sharing without having to integrate a multi-color palette in your design. 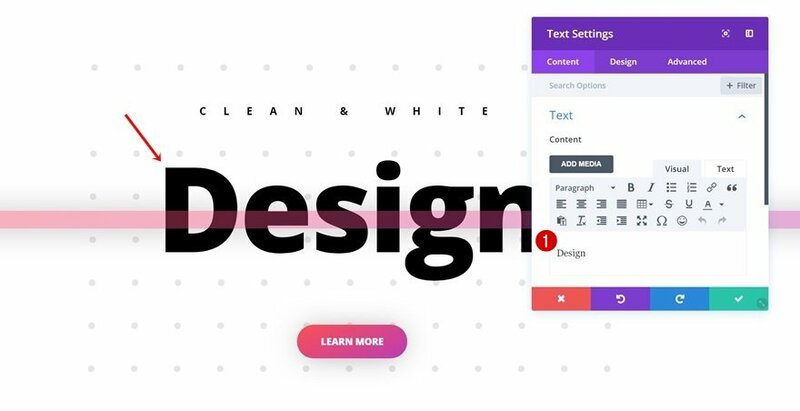 Like font sizes, it draws your visitor’s attention but in a different way than big font sizes do. 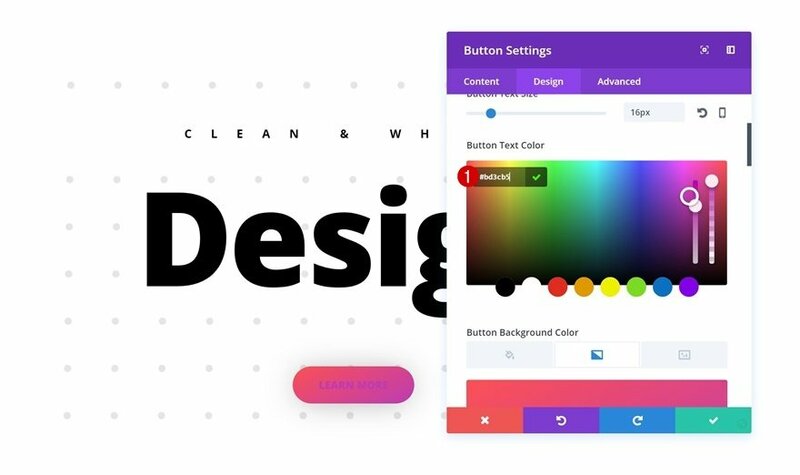 Another way to balance the clean and white design of your website is by using colors in an abstract way. 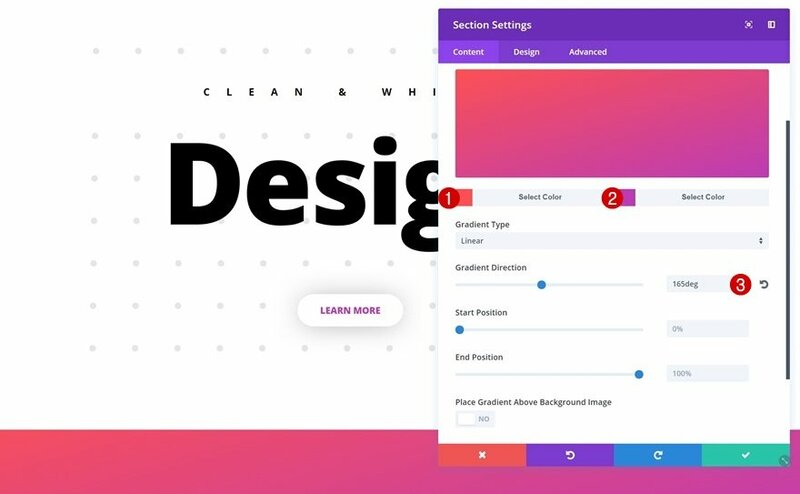 Using gradient colors for your calls to action, dividers and empty sections in combination with section dividers are some of those things that’ll allow you to create stunning results without losing that clean and white factor. 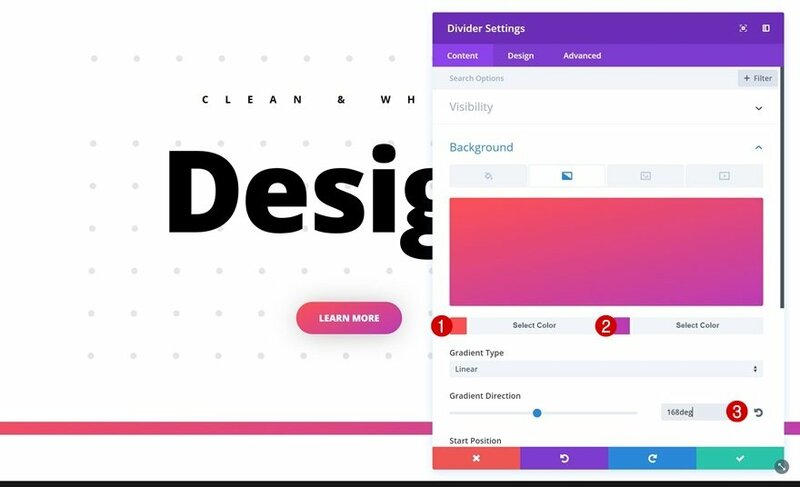 In combination with gradient and abstract design elements in your web design, a clean website also requires some depth. Not the ‘hard-to-miss’ kind of depth but rather the subtle kind that helps you take it up a notch higher. 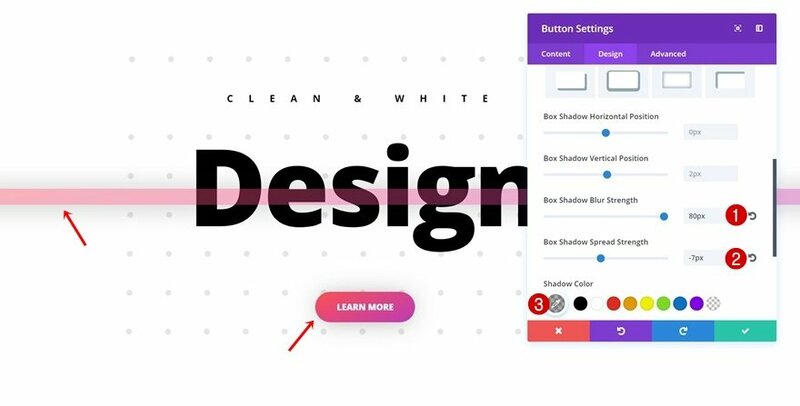 Subtle box shadows are characterized by a high blur strength in combination with a low spread strength and a light-colored box shadow color that doesn’t draw all too much attention but rather empowers the other design elements on your website. 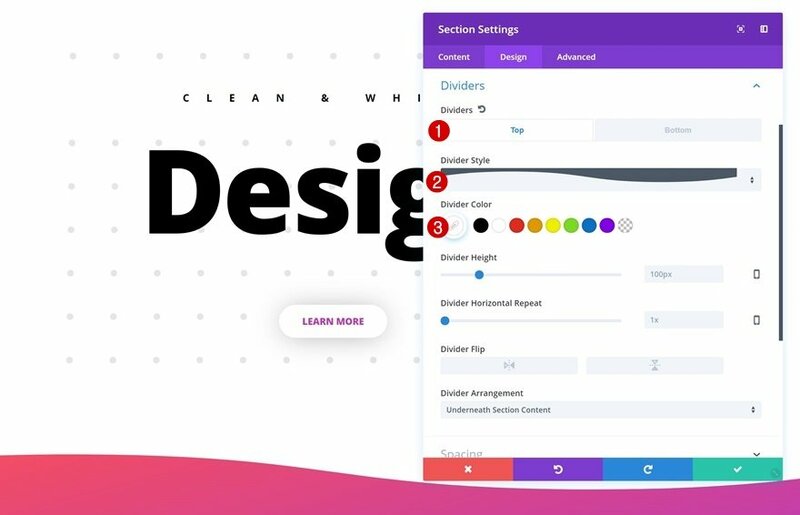 We’ve mentioned using gradient design elements such as dividers and empty sections in combination with section dividers. 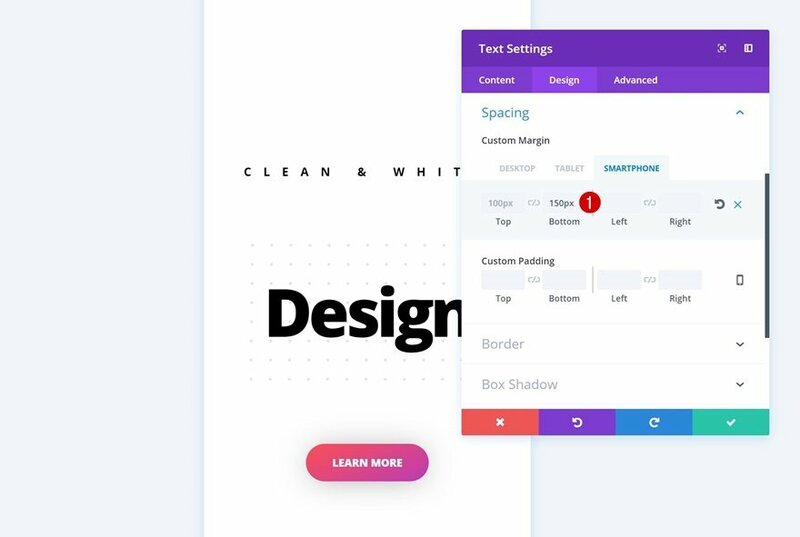 These elements are already gorgeous but to help make your design more complex (in a positive way) and abstract, you can easily use a negative top margin to make different design elements within your section overlap. 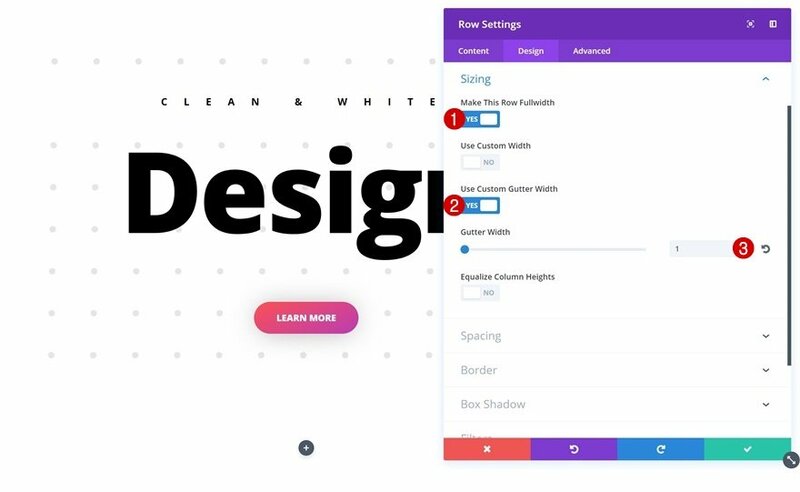 You can also modify this negative top margin according to how you want it to look on different screen sizes, whether it is desktop, tablet or phone. Now that we’ve gone through all the Divi techniques, it’s time to put them into practice. 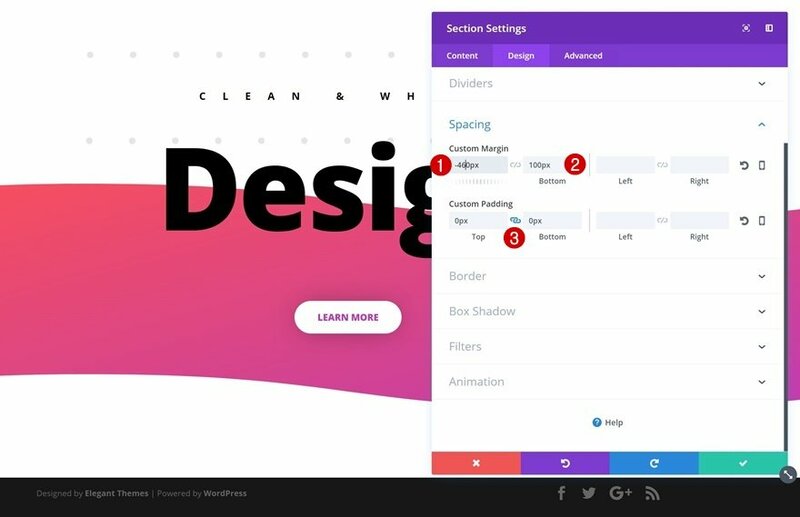 Let’s take a look at the design we’ll recreate on different screen sizes while keeping the different techniques in mind. We’re going to create two different examples. 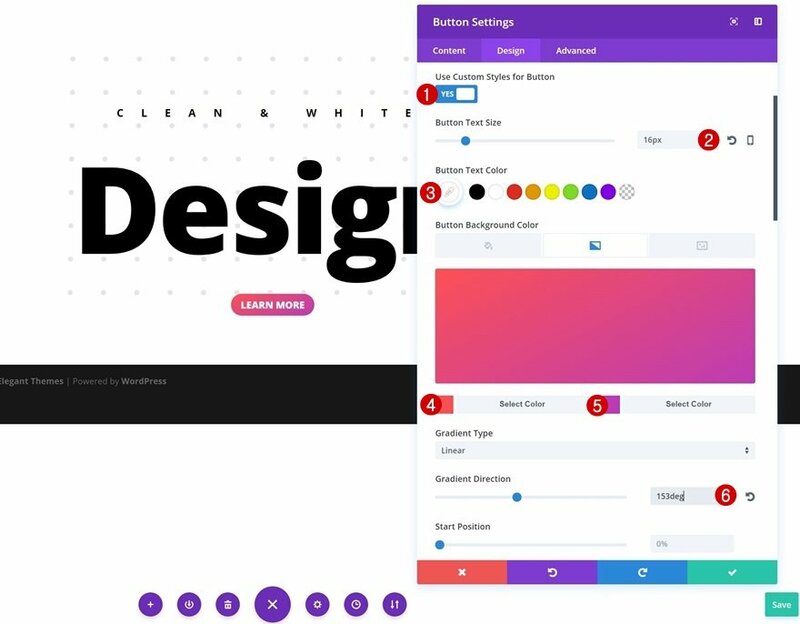 The examples are similar but differ in design elements. To ease the process, we’re going to go through the general steps first and once those are done, we’ll focus on each one of the examples individually. 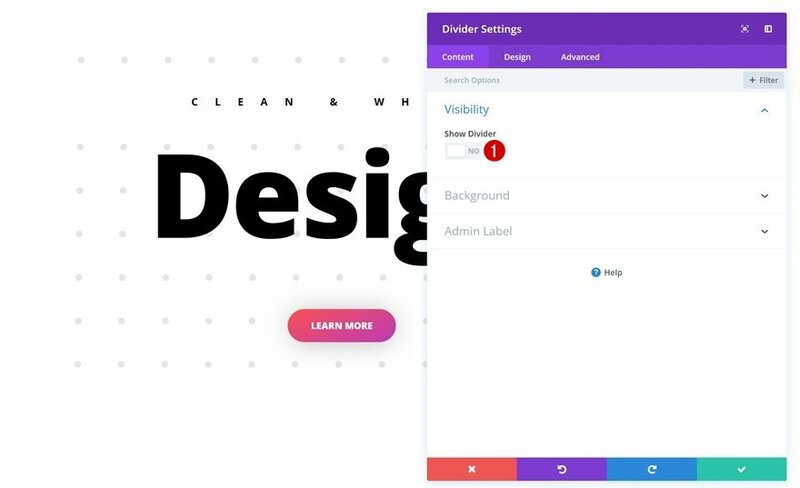 Start by opening a new page using Divi’s Visual Builder and add a new standard section. 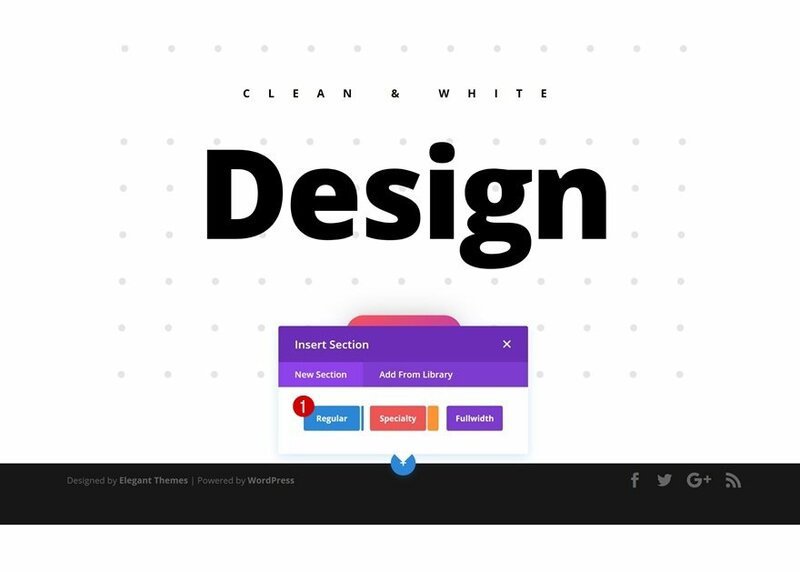 This section contains, by default, a white background color and that’s the way we’re going to keep it. Next, add a row to your section containing one column. 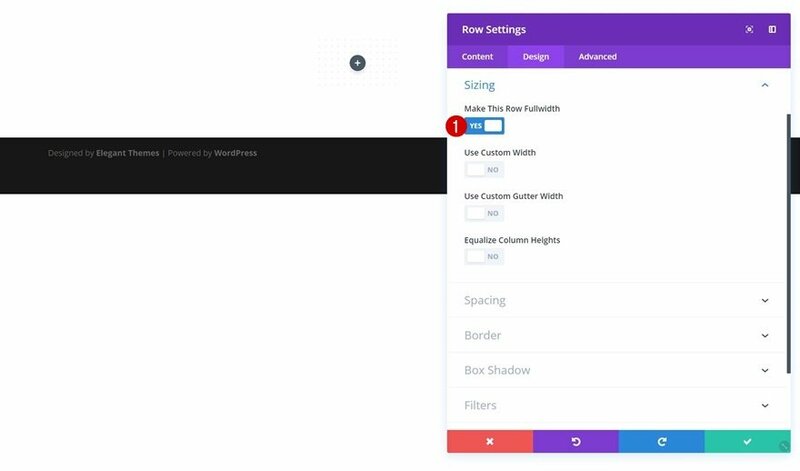 Open the Sizing settings next and enable the ‘Make This Row Fullwidth’ option. Now, let’s start adding modules! 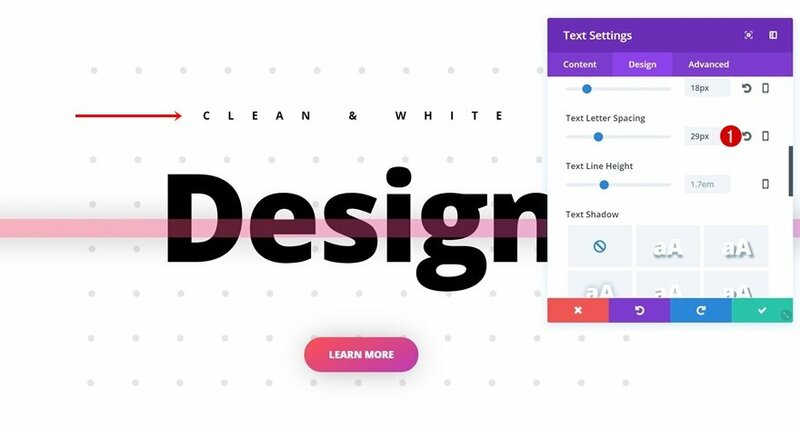 We’ll start with a subtitle and as mentioned in technique number 2, we’re going to break the pattern for this module using a white background color. 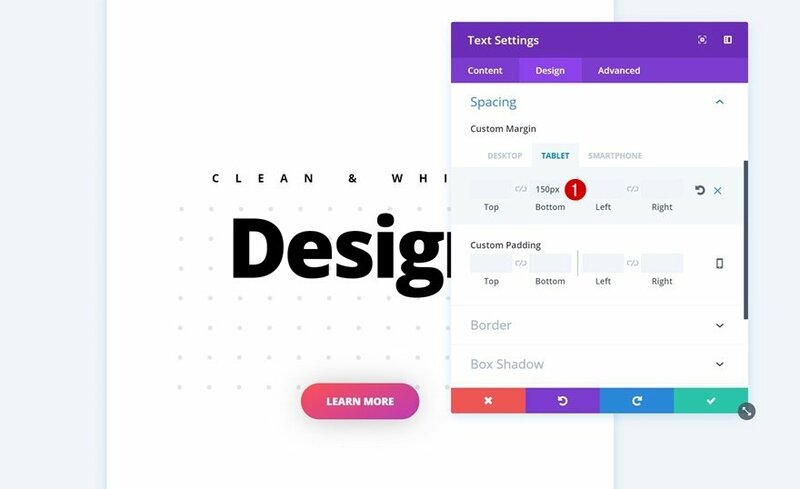 To create some space between the beginning of the pattern and our Text Module, we’re going to add ‘100px’ to the top margin of our Text Module. The third and last module in our row is a Button Module. 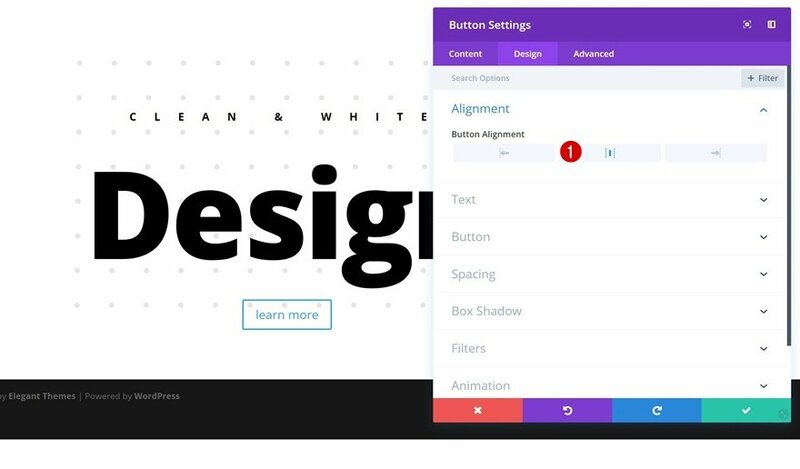 After adding the copy, go to the Alignment settings and use center Button Alignment. 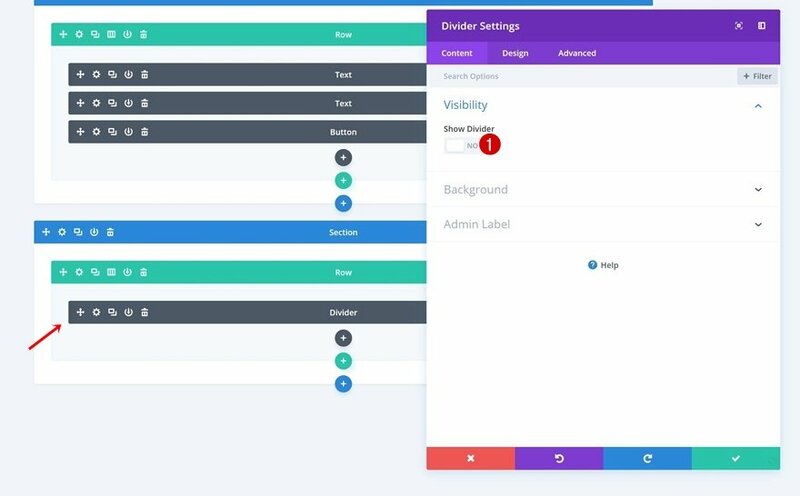 Add a Divider Module to your row and disable the ‘Show Divider’ option in the Visibility settings of the Content tab.  To make the Divider Module overlap our previous row and its modules, we’re going to use ‘-400px’ for the top margin. 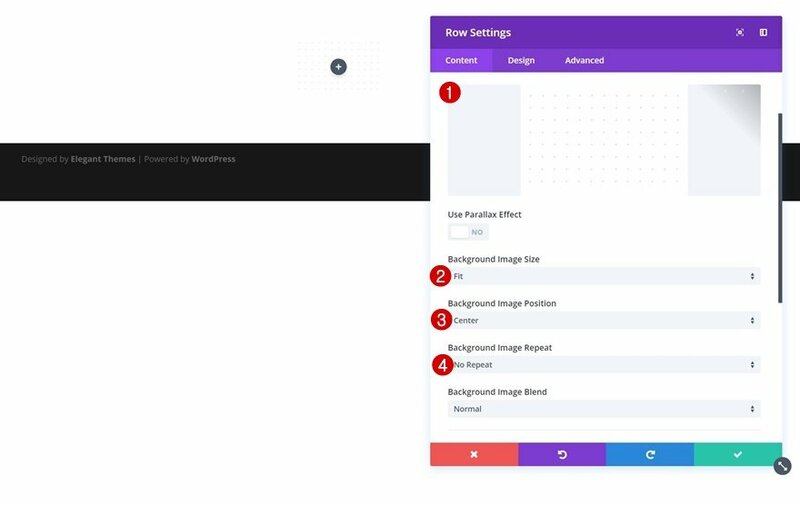 And to make the title Text Module of our previous row still show through, we’re going to adjust the opacity within the Filters settings to ‘43%’. Then, open the Button Module and change its Text Color into ‘#bd3cb5’. 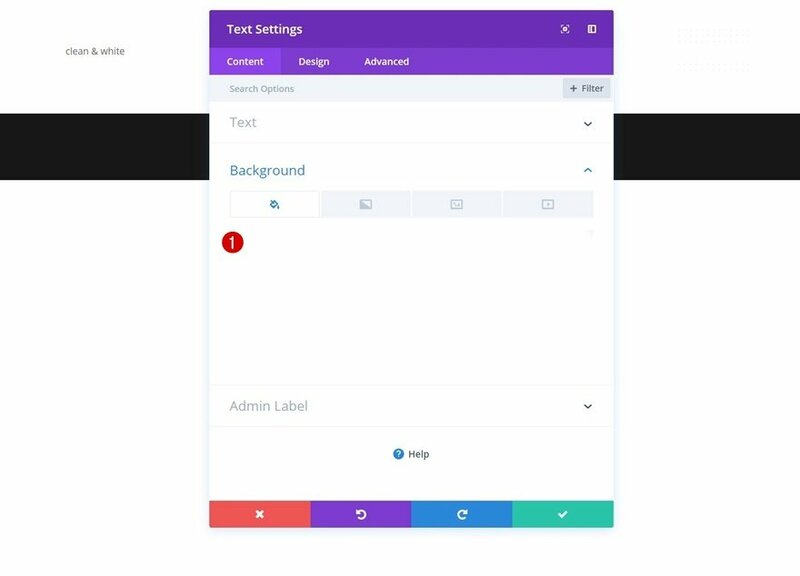 Go ahead and remove the Gradient Background of your Button Module next. 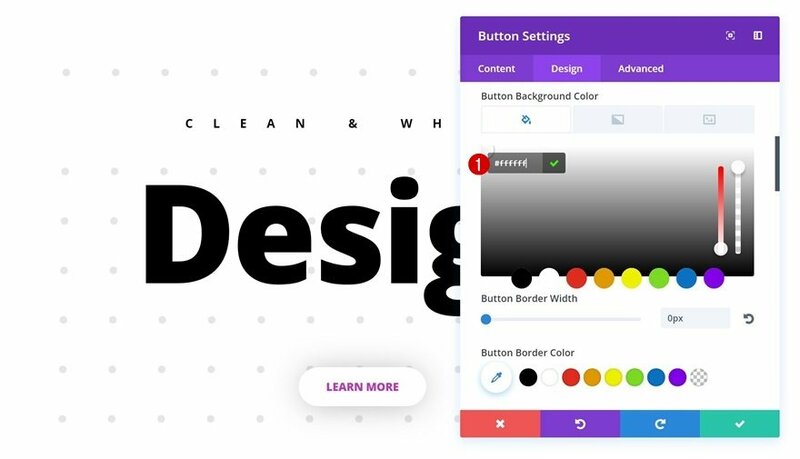 And add a white background color instead. Use the same settings for the bottom divider. 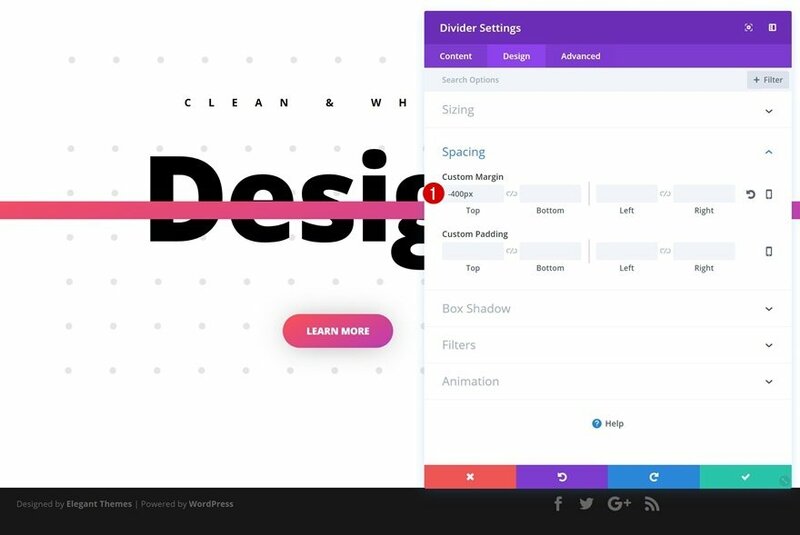 Add your Divider Module next and make sure you disable the ‘Show Divider’ option within the Visibility settings and you’re done! 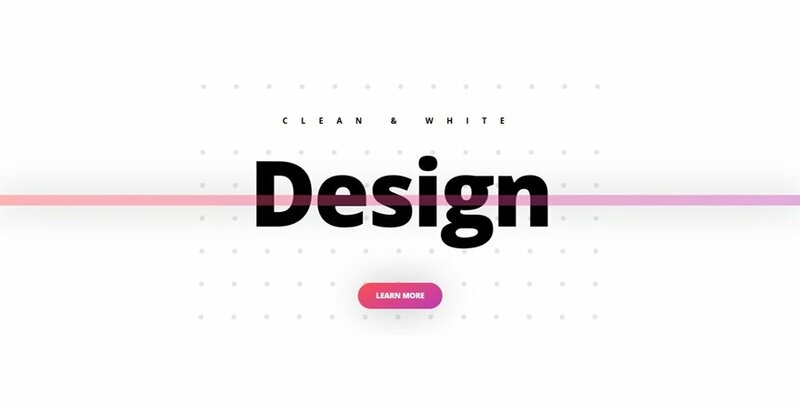 In this post, we’ve shown you some great techniques on how to achieve a clean and abstract website style. 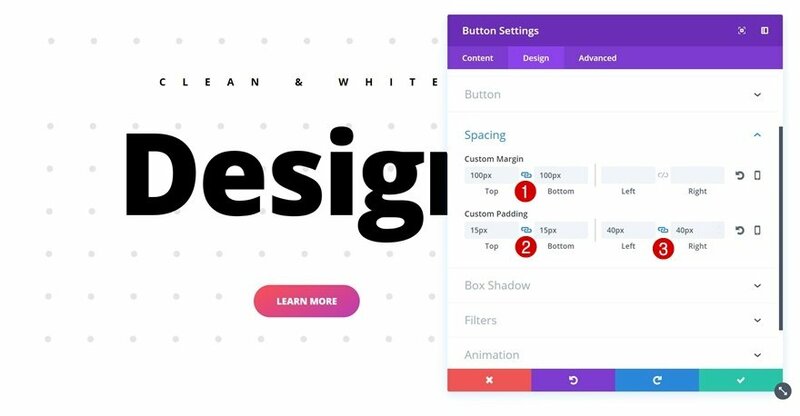 This is the first post of the series on how to make beautiful design styles happen using some of Divi’s finest built-in options. 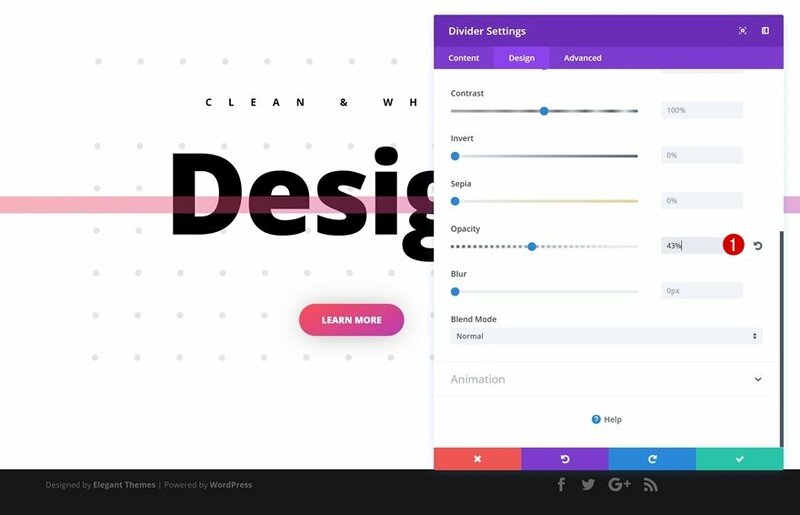 In the next series, we’ll share techniques on how to achieve more stunning design styles. If you have any questions or suggestions, make sure you leave a comment section below! 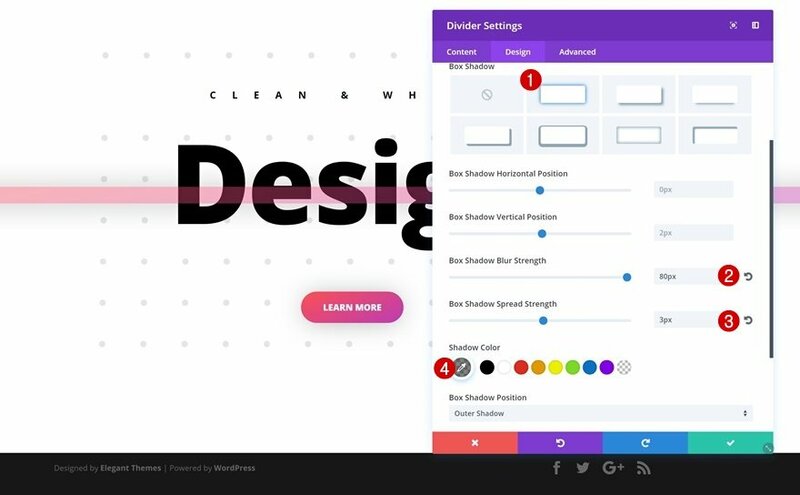 The post 8 Techniques to Achieve Clean & Abstract Designs with Divi appeared first on Elegant Themes Blog.